We really enjoyed the kiwi salsa on our grilled tempeh last weekend. It’s a very nice combination. Make a marinade from the soy sauce, water, vinegar garlic powder and onion powder. Place the marinade I a large shallow casserole dish. Slice the tempeh 1/3-1/2 inch thick locks or triangles. Place in the marinade for 1/2 hour. Spray a grill with oil and place the tempeh slices on the grill to cook. Cook evenly until lightly browned. Sprinkle with 1 teaspoon of sugar to draw out their juices. 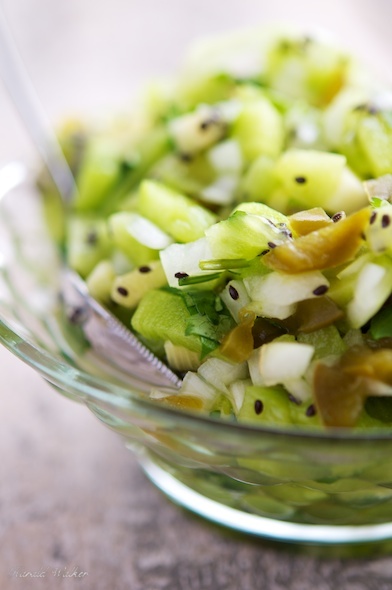 Chop the onion, jalapeño and cilantro and add to the kiwis. Sprinkle with lime juice and mix well. Season to taste with a small pinch of salt and pepper. Serve the tempeh with the salsa on top or at the side. 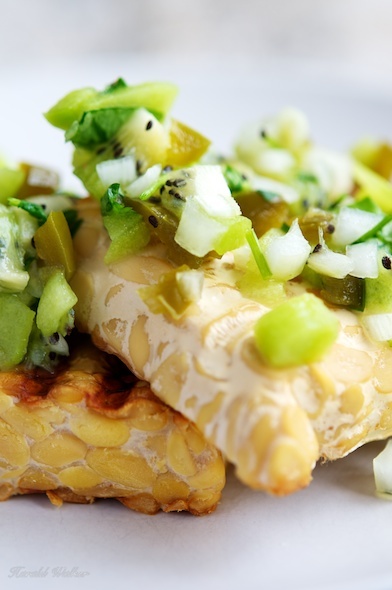 Posted by Chris Walker on April 23, 2012 in Kiwi, Main Dishes, Tempeh.